Everyone knows Nevada for its casinos and lavish hotels on the Las Vegas strip. There is much more to this state than that though, from the importance of the Hoover Dam to the Red Rock Canyon and Lake Tahoe at the border with California. It has some of the most beautiful parts of the country, hidden amongst an expanse of arid desert where nuclear testing was done for decades. The bulk of the economy in Nevada is in the tourism sector, but Tesla’s gigafactory will diversify the state's revenue streams a bit. There aren’t a lot of cities to choose from in Nevada, as 75% of the population lives around Las Vegas. We’ll go over the safety ratings of the available cities below. 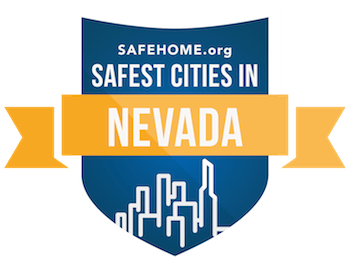 We were only able to rank the top 14 safest cities in Nevada, as there weren’t many that were eligible. Of those 14 cities though, the safety scores are on the good side, with a high score of 95.55 down to 71.21. Three of those cities ranked nationally, making it into the top 500 safest cities in the nation. The safest city was Yerington, with a population of 3,026 and a safety score of 95.55. It is located due east of Lake Tahoe, and is a small town with small town vibes. This is a safe town as it attracts people who are hardworking and self sufficient. Let's go over the most notable part of Nevada, which is the Las Vegas Metropolitan area. There are 1.5 million people here, along with another 500,000 in Clark County, which contains Las Vegas. Las Vegas itself has a safety score of 71.45, North Las Vegas is at 74.85, and surrounding cities like Boulder City and Henderson are at 89.23 and 82.44 respectively. Further north at the biggest little city of Reno, you’ll find a safety score of 71.21.